Silver and white wallpaper - How can I buy the silver and white wallpaper shown in this picture? Thank you for your response. Can you tell me what company makes the wallpaper ? 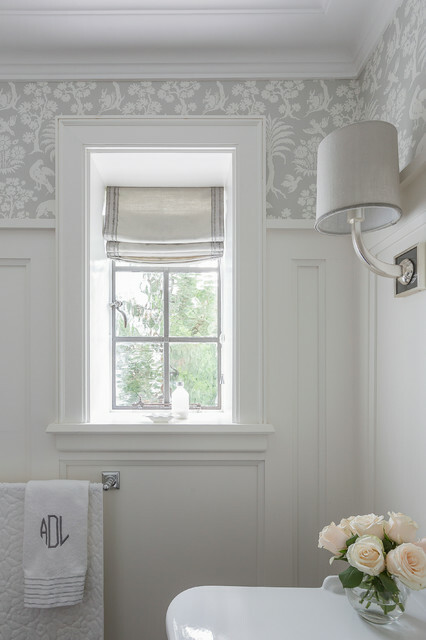 Clean white walls with wide simple molding and 2-color neutral wallpaper with oversized design. Chunky window, board and batten, silver fixture, linen fabric shade and roman blind. I like how high this is. Unsure what would be the right height with the horizontal window and its height.